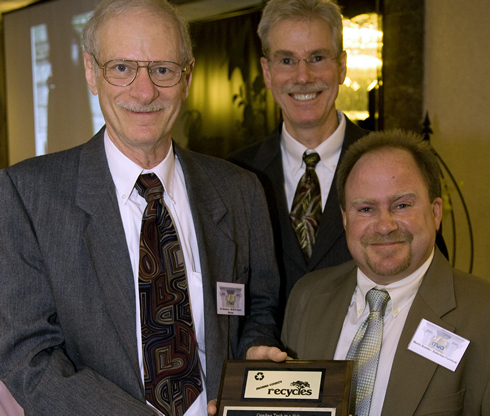 2008 and this year's recycling awards dinner commemorated the MCMUA's 50 year anniversary by recognizing all the MCMUA Board members that have served on the MCMUA since its beginning in 1958. 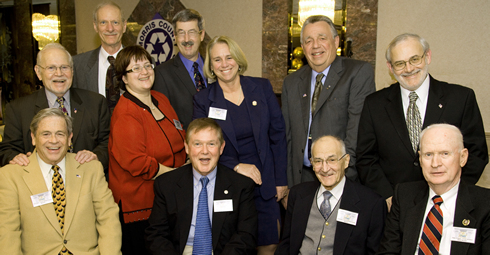 Four retired MCMUA Board members attended the dinner while seven current Board members also attended the gala. The MCMUA is proud to pay tribute to all those individuals that gave their, time and energy to make the MCMUA what it is today. 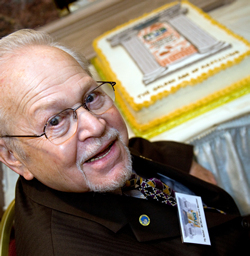 During the era that preceded the Golden Age of Recycling, Ron Kevitz was a key player in drafting the Morris County Solid Waste Management Plan. 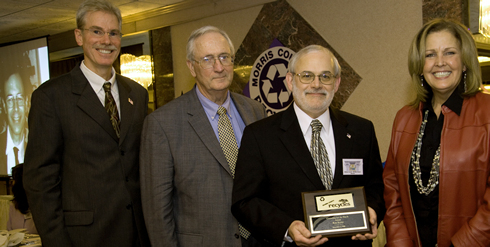 Ron applied considerable legal expertise as he worked with the Morris County Board of Chosen Freeholders, Solid Waste Advisory Council and staff to develop and defend the provisions of the county’s plan. 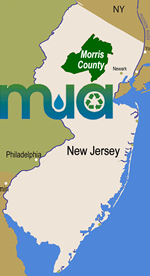 This involved executing the difficult and tumultuous tasks of conducting landfill and waste-to-energy siting studies, and dealing with the New Jersey Department of Environmental Protection. 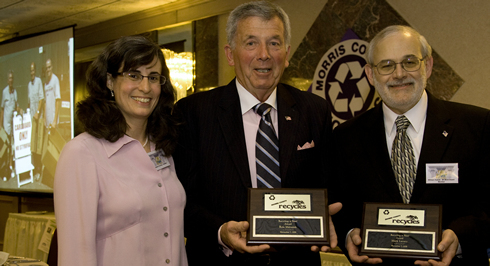 When he served as Morris County counsel, Ron ably advised the county as it included provisions for mandatory recycling in the county plan prior to April 1987, when recycling was mandated for the entire state of New Jersey. Recycling is Neat! Award – Mark Lavery and Ron Matusiak - Known as “the dynamic duo,” part-time employees Mark and Ron make a huge contribution as they maintain order at the East Hanover Recycling Center. 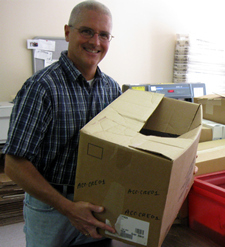 Mark, a congenial greeter, diligently oversees the corrugated cardboard compactor and the various roll-off containers to be sure that only the proper material goes into them. He also ferrets through used clothing that’s deposited at the center and gives the best to a local woman who sends it to Poland. Ron, a former marine with a droll sense of humor, is vigilant about keeping plastic bags out of the containers, for they wreak havoc with the equipment used to process recyclables. 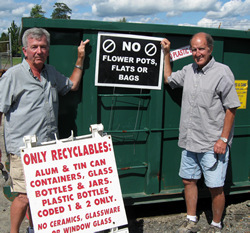 On his own initiative, Ron distributes flyers related to topics such as proper disposal of household hazardous waste, and he strongly encourages residents to recycle scrap metal. In the spirit of “One person’s trash is another’s treasure,” both men have removed various items such as tables, chairs and toys from the bulky waste disposal pile and set them aside to give to someone to reuse. In the olden days when he worked at Prudential, Don contacted the MCMUA to request assistance with disposing properly of fluorescent bulbs. 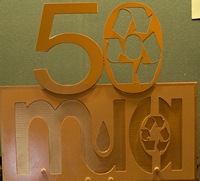 After acquiring the title of lettershop manager for Fulco Inc. in Denville, a small company involved in “magazine fulfillment,” Don again contacted the MCMUA to ask for help with recycling paper, bottles and cans. 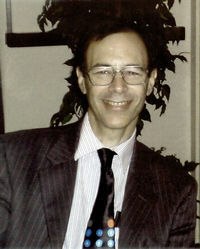 By the way, Don says all of the following tasks are related to “magazine fulfillment”: sending labels to printers; sending renewal letters, bills and invoices for 80 publications to subscribers; sending magazines to subscribers who didn’t receive specific issues; and sending back issues of magazines (Fulco keeps back issues in stock for 24 months). Because of Don’s efforts, Fulco contracted with the MCMUA for once-a-week collection of bottles and cans, and the large quantities of paper it generates. In his very hands-on way of tackling recycling, Don always requests make-up collections when holidays occur on regularly scheduled collection days. And he’s quite proud of being a good recycler at home! “We used to have bi-weekly trash collection, but now we have it about once every ten weeks,” said Martin Brooks, operations manager at the Suburban Furniture and Mattress warehouse in Randolph. 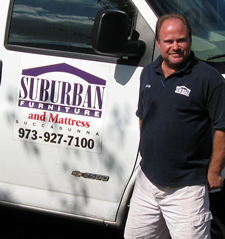 Hired three years ago to move the store’s operations from Netcong, Martin noticed that solid waste disposal costs were “out of sight.” He applied lots of elbow grease, and the result has been a 50% reduction of solid waste. For non-recyclable solid waste (trash), Suburban uses an augur compactor that grinds trash up, thus saving space in the roll-off container. In addition to recycling corrugated cardboard, bottles and cans, and scrap metal, Martin recycles used mattresses and box springs that have been replaced with new ones (he fills a 28-foot straight truck every month and a half). He also delivers 500 pounds of polystyrene and some pallets to Foam Pack Industries in Springfield, N.J., and backhauls recyclables from Foam Pack to a recycling vendor in Morris County. The polystyrene is put into plastic bags that were originally on new furniture delivered to the warehouse. “I feel great when I see a truck loaded with polystyrene about to leave from Foam Pack,” Martin remarked. He also makes sure that any furniture with reuse potential finds a home, and often that home is a non-profit agency, such as the Morris Habitat for Humanity ReStore. One thing is for sure: Martin Brooks is on the go; he has no time to relax in any of the comfy lounge chairs at the warehouse! Directly from the Kinnelon Conserves Web site: “Kinnelon Conserves is a grassroots environmental education initiative designed to boost environmental awareness. Through programs, communication and events, we encourage residents of all ages to learn about sustainable, Earth-friendly living, and to share what they learn with others.” Indeed, Kinnelon Conserves volunteers have participated in nine public events during the past year and a half, at which they asked participants to sign an informal pledge called The 1000 TON Challenge: “I pledge to become more aware about my use of energy and natural resources. I will do my best to replace wasteful habits with wise ones, to conserve energy and natural resources, and take action to prevent 5000 pounds of unnecessary pollution.” Accompanying this pledge is a list of ways to save money and energy; the second entry on the list touts the virtues of recycling ALL paper, aluminum and plastic (#1 and #2). 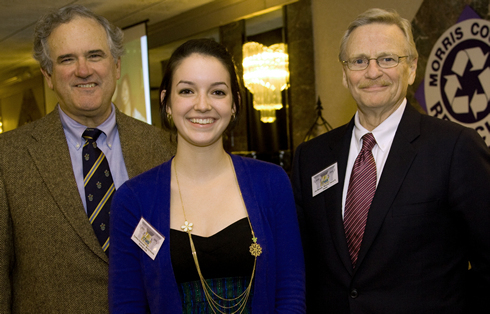 Avery Hart and a group of other dedicated volunteers have created a Web site with pages devoted to recycling, conservation, and available resources. To top off the whole project, they promote this idea: Let’s have fun as we learn together. A member of the Jefferson School Environmental Committee, Pam Altman has devoted countless hours to make sure the inhabitants of the pre-K-grade 4 school in Roxbury are respecting Mother Earth. 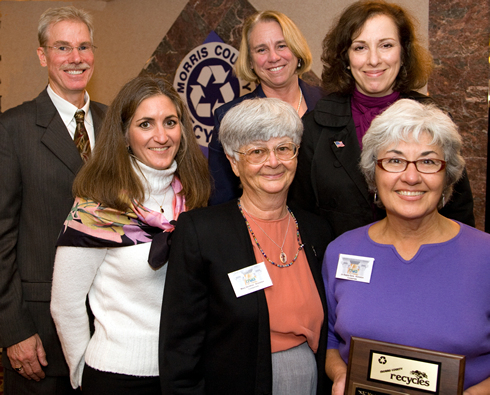 She was instrumental in getting the recycling program up to snuff. She made arrangements for several environmentally related assemblies to be presented. 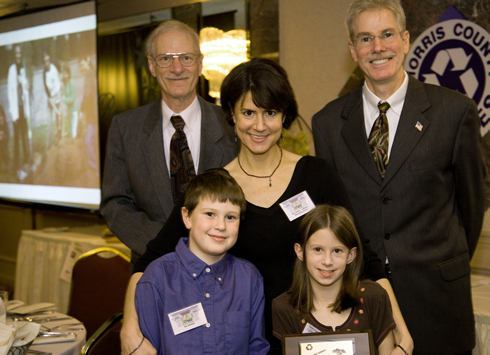 Her suggestion that the science fair focus on environmentalism was taken to heart; the theme was “Conservation in Daily Life.” She was involved with a project through which students sent environmental tips to Principal Karen Carlson; many of those tips were read by fourth graders on the public address system near Earth Day. 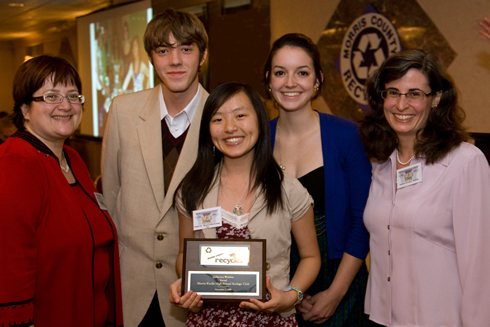 Pam also coordinated “No Child Left Inside Day,” which was celebrated on April 30. 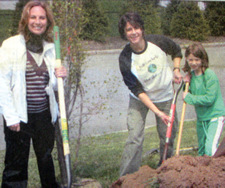 On that day, students and parents planted flowering dogwood trees and maple trees on school property. Also, Pam wrote “Eco-Action” articles for the school’s monthly newsletter, the topics of which were saving paper; conserving water; saving energy; reducing, reusing and recycling; and the advantages of replacing incandescent light bulbs with compact fluorescent bulbs (CFLs). 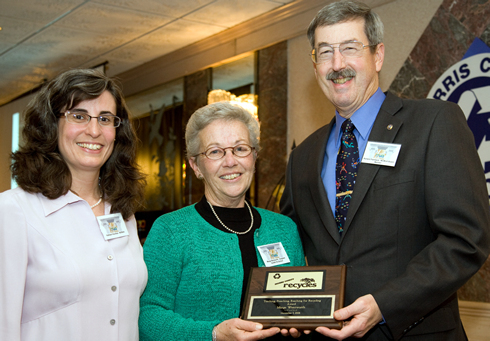 Pam is a go-getter who has both the right and the “write” angle on environmental stewardship. “The students are making the connection between the school and the larger community as they learn about various environmental matters,” said Elizabeth Pentz, educational supervisor at Park Lake School in Rockaway Borough. 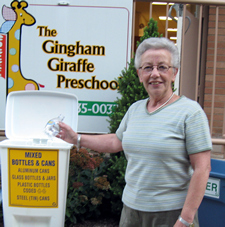 “We realized that it is critical for our special needs kids (ages 3-15) to be familiar with recycling,” offered Principal Sheryl Kaufman, Ed.D., who also admitted she’s become more conscientious about recycling at home because of what’s occurred at the school. Rockaway Borough provided recycling containers to the school, MCMUA Recycling Specialist Liz Sweedy visited to explain how recycling works, and an assembly program featuring live animals who fare much better if their habitats aren’t damaged by human activity, was given. All of this was related to the development of a vocational life skills program. 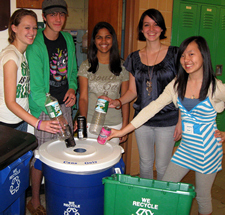 The students are taught how to recycle bottles, cans and paper in the classrooms and elsewhere at the school. Some of them read local newspapers and then prepare those newspapers to go to the Rockaway Borough Recycling Center. Every Friday, students load recyclables onto a school bus and make the trip to the recycling center where they unload them and put them into the proper containers. In doing so, they’re acquiring valuable occupational skills. “The kids realize they’re making a difference in their school because they’re doing something good,” remarked Stacy Gebbia, a teacher. 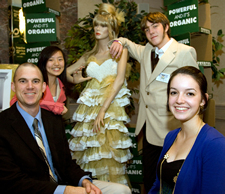 “Our mission is to save the world!” is the hue and cry of members of the Morris Knolls High School Ecology Club. Located in Denville, Morris Knolls is a regional high school serving 1,600 students from Denville and Rockaway Township. 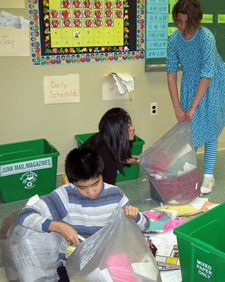 A few years ago, the 40-member club established a goal of stopping the stream of waste paper generated at the school from being sent to the landfill. 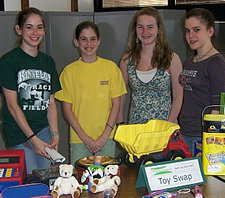 Because there was no money available for purchasing recycling containers, the students devised a fund-raising program, which included selling home-baked goods and collecting used inkjet and laser printer cartridges from students, faculty and staff (Cartridge World of Rockaway supplied the club with a collection box and also purchased the cartridges. They earned enough money to buy recycling receptacles. 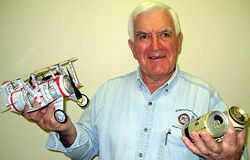 Club members also met with Steve Ternosky, supervisor of buildings and grounds, to map a collection plan. 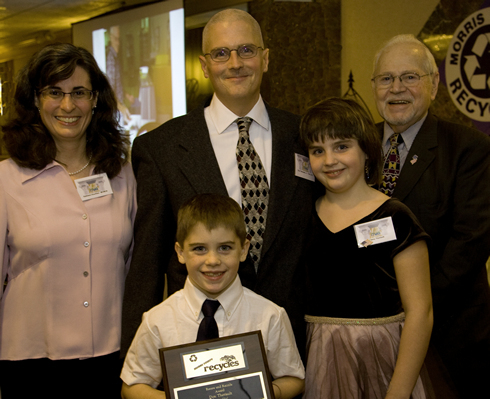 Phil Kirby, a special education teacher who introduces students to various vocations, played a role too, for he realized the importance of involving the students in recycling (shades of Park Lake School). As a result, the students empty the contents of recycling receptacles located throughout the school into larger containers, after which the custodians deliver the recyclables to the Denville Recycling Center. Clearly, by applying its “collective” wisdom, the Morris Knolls High School Ecology Club is on the way to saving the world. 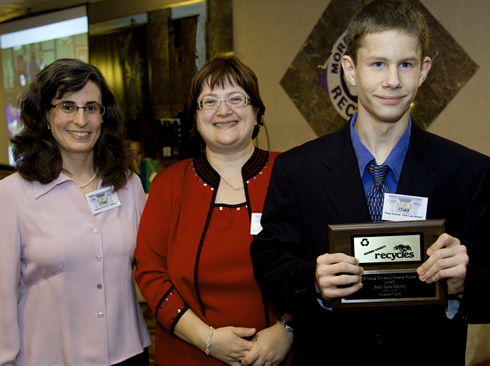 Eric Mindrebo, a science teacher at Morris Knolls High School and advisor to the ecology club, wrote the following in a letter recommending Cynthia for acceptance by the Governor’s School on the Environment: “Through her leadership, this club has blossomed into a group of students who are bonded by their love of the environment, and Cynthia has provided them with opportunities to have an impact on the school and the world around them.” Cynthia was selected to attend and did attend the Governor’s School on the Environment. 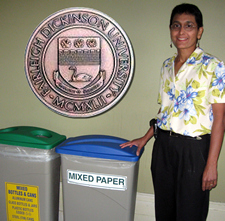 Recycling – It’s Academic! 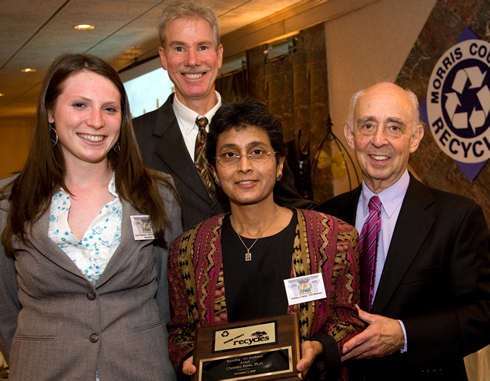 Award – Christine Farias, Ph.D.
“Why aren’t there recycling bins on the Fairleigh Dickinson University (FDU) campus?” is the question Dana Patterson asked Dr. Christine Farias, her microeconomics instructor. Ever since they wrestled with that question, Dana says Christine has been the number one change agent on the campus. First she rounded up a group of students to form the Green Club. Then she researched where the trash was going, why recycling wasn’t happening, and what measures should be taken to make recycling a reality. 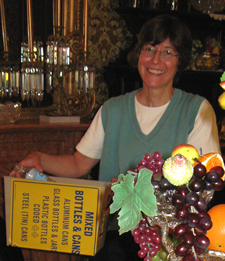 At the same time, with approval from the administration, she entered FDU into Recyclemania, a nation-wide recycling contest open to colleges and universities. Later, after she was appalled by witnessing the huge quantities of perfectly good, new and used items that had been put into the trash during Move-Out Weeks, Christine developed a collection/reuse system for such items. Now, during the last two weeks of the semester, boxes labeled for different items are located in the dorms. After students fill the boxes, the contents are put into PODS (large storage containers), and then non-profit organizations such as American Red Cross, Goodwill Industries, Salvation Army, and local shelters avail themselves of the material, thus preventing it from being landfilled. 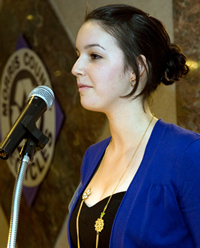 At the same time she was involved in these endeavors, Christine advised the Green Club, which sponsored two viewings of the documentary An Inconvenient Truth, conducted campus clean-ups, staffed information tables at Earth Day events, and more. “My main focus has been raising consciousness,” affirmed Christine, “and right now I’m dreaming of an on-campus rummage sale.” This from a woman with a Ph.D. in environmental economics and a dissertation on deforestation and the carbon sink value of forests. Plywood for the roof is from managed forests in which multiple trees are planted for each one that’s cut down. Heating and air conditioning systems are designed to use nearly half the electricity of conventional systems. The exterior glass system is four times more efficient than conventional glass. The paints and glues used in the construction do not contribute to greenhouse gas emissions. Selected exterior plants require half the water normally used for landscaping. Pre-manufactured exterior panels reduce the construction waste. All metal panels on the roof, as well as the steel structure of the building and fabric and carpet are made from recycled material. 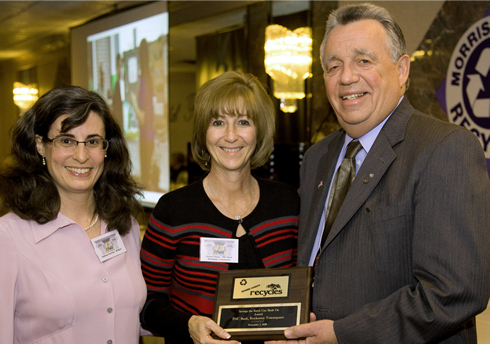 Global “Worming” Award – TerraCycle, Inc.
“We’re recycling the Earth’s own materials; that’s why our name is TerraCycle,” explained Albe Zakes, vice president of media relations. A bit of history. In the fall of 2001, Princeton University students Tom Szaky and Jon Beyer co-founded TerraCycle in Room 82 at Blair Hall, a dormitory. The two men wanted to process waste and turn it into a useful product; thus, their plant food made from worm poop and trash was born. The plant food was and continues to be bottled in previously used plastic bottles (please see the bottles of plant food on your dinner table). 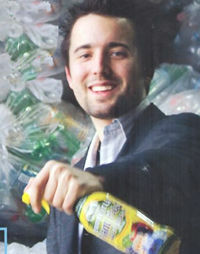 Tom left Princeton during his sophomore year in order to devote more time to TerraCycle; he’s currently the chief executive officer of the company. 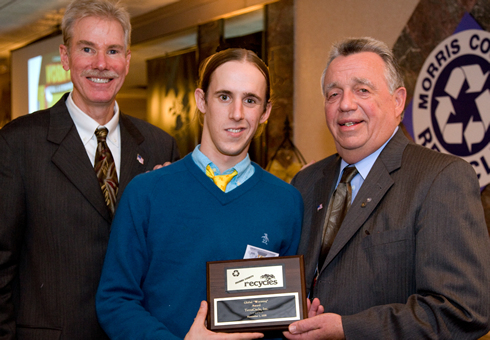 At different times between 2001 and 2008, TerraCycle expanded its line of products. Note the green flower pot in the center of your table; it’s a TerraCycle product made in the U.S.A. of plastic from computers and other business equipment that otherwise would have ended up in a landfill. Urban artists paint the flower pots. Then there are accessories such as tote bags and messenger bags made from juice pouches and cookie wrappers (surely you’ll recall seeing at least one of these creations in this evening’s fashion sh`ow). Interestingly, Kraft Foods, which is headquartered in East Hanover, N.J., has sent overruns and misprinted and discontinued goods to TerraCycle to be used in its products. And though there isn’t one at “The Golden Age of Recycling,” TerraCycle “repurposes” Kendall-Jackson’s cast-off oak wine barrels into rain barrels. 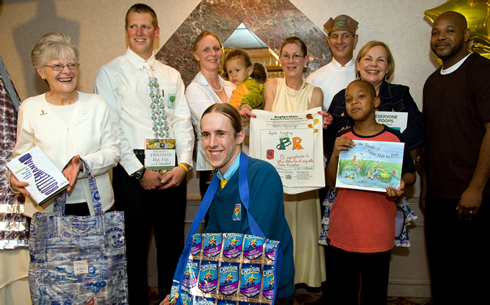 “‘We became the world’s first company to make everything out of trash’ Mr. Szaky said” (The New York Times, May 21, 2008). And aren’t we glad! 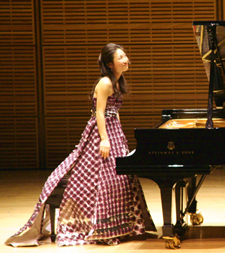 From Carnegie Hall to the Hanover Manor – the concert pianist’s gown, a very special guest - On Tuesday, February 19, 2008, Julliard-trained concert pianist Soyeon Lee made her Carnegie Hall debut wearing a gown made from more than 5,000 Honest Kids™ Goodness Grapeness drink pouches. Interestingly, the title of Ms. Lee’s performance was “Re!nvented.” TerraCycle commissioned eco-designer Nina Valenti to create the gown. Ms. Valenti stitched together square panels cut from the drink pouches into “a strapless gown with elaborate layers and wings” (The New York Times, February 14, 2008). Underneath all those juice pouches is a silk taffeta lining. For more information about TerraCycle’s collection program for drink pouches and other items, visit www.terracycle.net/brigades. Of course it does. Chances are, though, that recycling will fly even higher over the next few years. 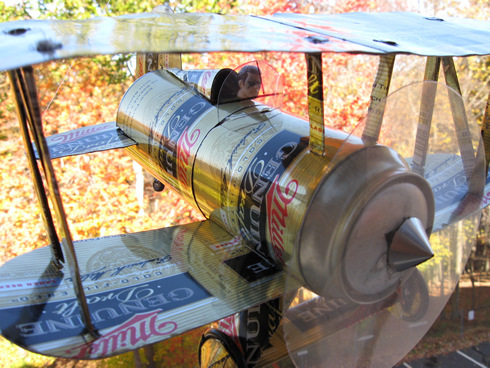 To give that idea a boost, Hanover Township resident John Keena has created a “golden” airplane for the MCMUA from some used aluminum beverage cans. How very fitting, for John was a pilot not so long ago. The following models grace the runway this year: Albert Lance Carpenter (he flew in from Dallas, Texas, to represent Frisco, his hometown, which has an award-winning recycling program), Glinda Garbahj, Brian Jacobus, Soyeon Lee, Tomas Monteiro, Helen O’Keefe, Solweig von Minden, Fred Wilson and Myles Wilson. 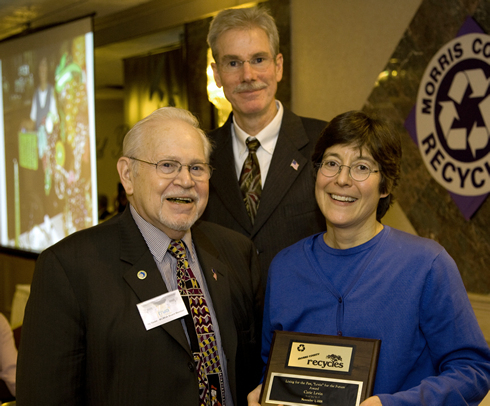 Miranda McMua, named in part for the character whom Cynthia Nixon portrayed on an HBO show about life in New York City, once again is delighted to attend a recycling awards dinner. Leeza Tea Coco Chanel, MCMUA designer in residence, has transformed a consignment store find into a gorgeous golden gown for Miranda by adding a cascading overlay of crinkled toilet tissue wrappers and tulle. The cake - Seventeen large sheet cakes in a row. Add this year’s cake and that makes 18, the number baked by MCMUA member Herman (“Hy”) Nadel, aka the Cake Man, for our dinners. Kudos to Hy for replicating those pillars! Thanks to TerraCycle for donating quite a few of the bottles of plant food, and thanks also to the following donors of door prizes: Atlantic Coast Fibers, Inc.; Green Sky Industries, Inc.; Rainbow Promotions; Reliable Wood Products/Reliable Paper Recycling; and Nature’s Choice. The musicians - For the 14th consecutive year, Shot of Redemption is providing live music. To book them for an event, call 845-255-3177.